The 13" Professional Frontloading Laptop Case from V7 is sleek and durable. 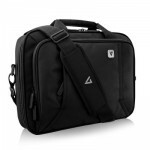 The case features a padded laptop compartment with a velcro strap to keep your laptop secure. It has a soft, padded handle so it's comfortable to carry. The zippered outside compartment has ample room for your smartphone, and accessories. It also features a new RFID Pocket to protect your ID Cards and chip-based credit card information. The back of the bag has a pass-through for rolling luggage, making this case the perfect companion for business trips.